Numerous Wesleyan players have earned post season accolades as various newspapers and other organizations have released their awards recently. 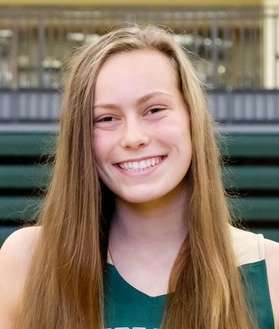 Junior AC Carter earned quite a few awards this season as she was named First Team All State by the Atlanta Journal-Constitution. 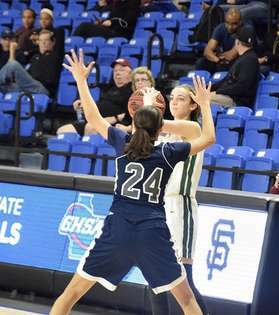 She was also named First Team All Gwinnett County by the AJC, Gwinnett Daily Post and Gwinnett Tipoff Club. She was voted to the Metro Team of the Year by the Atlanta Tipoff Club as well as voted Region Player of the Year for Region 5-A. 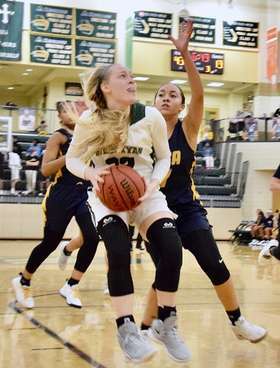 Sophomore Paige Lyons was named All State Honorable Mention by the AJC as well as Second Team All County by the Gwinnett Tipoff Club. Lyons was named First Team All Region 5-A while teammates Nicole Azar, Izzy Larsen, Alyssa Phillip and Callie Weaver were all named All Region Honorable Mention. Wesleyan players also earned post season accolades from the sandyspeil.com for Class A. Carter was named First Team All State and Best Rebounder, Lyons was named Second Team All State and Best Passer and Azar was named Best Shooter. Congratulations to all of these players for these well earned honors and awards. Here's another Wesleyan girls basketball fun fact. Coach Jan Azar has won more state championships than any other girls basketball coach in Georgia history. Azar started the girls basketball program in 1997 when Wesleyan fielded its first varsity team shortly after adding a high school to the previously K-8 school. In 21 completed seasons, she guided her teams to 13 state championships and four state runner up finishes. Since qualifiying for the state tournament for the first time in the program's brief history in 2001, that team made it to the state championship game but fell short. Since 2001, Azar's teams have made it to the state championship game every season except 2003 which produced a quarterfinal round loss. So in the last 18 years, various Lady Wolves teams have played in the state championship game 17 times, winning 13 titles. Azar has won twice as many titles as coaches who are tied for second place. Below is a list of coaches in Georgia who have won at least three state championships in girls basketball. Wesleyan and Holy Innocents took the court to battle for a state title for the fifth straight year. 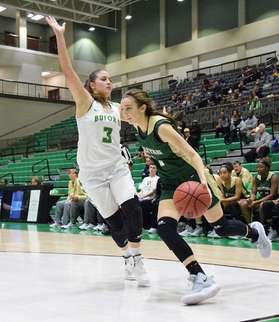 Round five went to Bears as they wore down Wesleyan in a 75-48 win yesterday at the Macon Coliseum. 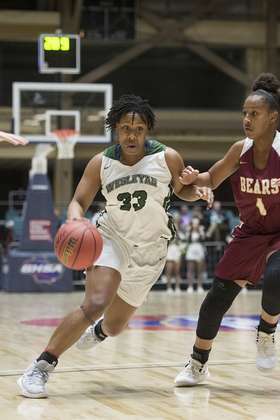 Wesleyan had won three of the previous four state championship matchups with Holy Innocents but the 2019 title wasn't meant to be. Holy Innocents was the better team this year. The Lady Wolves kept it close for a half trailing 16-11 at the end of the first quarter and 27-18 at the half. Holy Innocents size, mainly sophomore Jillian Hollingshed, was too much for Wesleyan in the second half. Wesleyan trailed 53-34 at the end of three and the game was essentially over. Holy Innocents was simply too deep and too tall. AC Carter led Wesleyan's scoring effort with 17 points to go with nine rebounds. Paige Lyons had 11 points, two rebounds and two assists. Nicole Azar scored 10 points including going 3-for-5 from behind the arc. She also led the team in assists with three and had two rebounds and one steal. Alyssa Phillip added six points and four rebounds while Jessie Parish, while playing ill, scored three points and had one rebound. Wesleyan finishes it's season 28-4 and with its fifth state runner up trophy to go with 13 state titles, and with a coaching staff and players who have always represented Wesleyan School impeccably with class on and off the court. 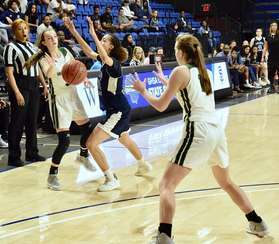 For the second straight year, Wesleyan faced higher ranked, higher seeded St. Francis in the semifinals of the state tournament. And for the second straight year, the Lady Wolves sent St. Francis home with a double digit loss. Wesleyan won a hard fought 66-52 contest despite having four of five starters either foul out (Callie Weaver and Izzy Larsen) or play with four fouls (AC Carter and Nicole Azar). Despite playing with these challenges, Wesleyan only trailed briefly. St. Francis led 4-2. An Azar three pointer gave the Lady Wolves a 5-4 lead they would never relenquish. Wesleyan closed the first quarter on a 13-6 run taking an 18-10 lead at the end of the first quarter. The teams played evenly in the second quarter as Wesleyan outscored the Lady Knights 17-16 in the period to lead 35-26 at halftime. Things got dicey in the third quarter as Wesleyan did not score a single point for the first four minutes as St. Francis closed the gap opening the period on a 10-4 run. A 6-1 foul advantage aided this effort. The lead was just 39-36 at the 3:00 mark of the period. That was as close as St. Francis would ever get as Wesleyan closed the third quarter with a 6-0 run to push the lead to 45-36. Wesleyan did a nice job of ball control in the fourth quarter, specifically point guard Paige Lyons. The Lady Wolves won the period 21-16 to secure their 16th straight trip to the state championship game and 18th in the last 19 years. 18 trips to the state championship game in 19 years must be some sort of record in team sports in Georgia. AC Carter was the catalyst behind the Wesleyan effort today as she put up 25 points and pulled down a whopping 19 rebounds. She also had four assists in a monster effort. Weaver had 11 points, two rebounds and one assist while Lyons had 10 points, three assists, three rebounds and two steals. Azar also had 10 points while grabbing two boards. Freshman Jessie Parish had a huge game and was a major reason for the win with her solid interior play against the tall St. Francis lineup. She had 5 points, 11 rebounds and two blocks. Alyssa Phillip added five points and four rebounds for Wesleyan who improves to 28-3 on the season. St. Francis' year once again ends in the semifinals as they finish 25-5. Waiting for Wesleyan in the finals, as usual, is Holy Innocents. This will be the fifth straight year that Wesleyan and Holy Innocents will meet in the state championship game. Wesleyan won the 2015 Class AA title over the Bears while Holy Innocents won the 2016 AA title. Both schools were then reclassified to Class A but that didn't change the state tournament hierarchy. 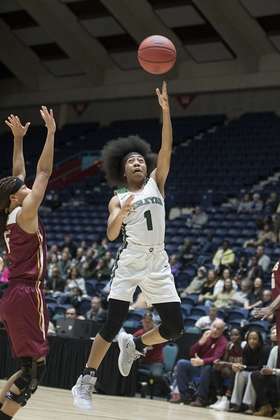 Wesleyan defeated Holy Innocents in the 2017 and 2018 Class A championship games. The 2019 Class A state championship game will be played this Wednesday at 2:00 PM in the Macon Colesium. Please come out and support the Lady Wolves as try to make history. 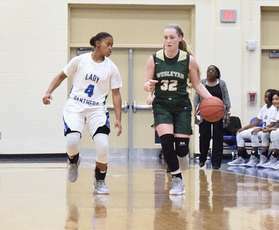 The first play Callie Weaver made in Wesleyan’s quarterfinal game against Lakeview Academy on Tuesday was to plant her feet in the path of a body moving at full steam.Weaver drew that charge and another one later in the game to tie the school’s career record with 47. Thirty-three of those have come this season. Six came in one game alone. Both are Wesleyan records.“It just speaks to her toughness and her willingness to do the things others don’t want to do,” head coach Jan Azar said. “Which is her trademark.”To Weaver, it’s worth the initial pain, the residual aches the next day, to swing the momentum of a game.“It hypes me up — and then you see your teammate running over and they’re screaming,” Weaver said. “It’s the moment. It’s a team booster and it’s almost fun in a way.“It’s also a hustle play and it’s being in the right place. It’s just something you can always do, if you’re willing to do it. It’s easy for me to do because I love this team and I would do anything for them. 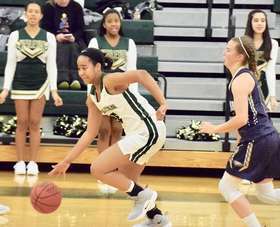 Putting myself in front of someone going (full speed) feels like a no-brainer to me.”Weaver is Wesleyan’s lone senior this year and every bit the leader Azar needed.“It’s hard to be on a team where your senior captain plays as hard as she does and not want to play that hard also,” Azar said. “I’ve coached a lot of players and I wish I could tell you I shot the ball like Nikki Luckhurst or that I could run the court like Mikayla Coombs or I could jump as high as Anne Marie Armstrong.“But I see myself more in a Callie because no one ever, ever, ever had to tell me to play harder. I left it all on the court. I think that’s why Callie is so special to me. Whether we win or lose in the next week of our life, I will never be disappointed in what Callie has brought to our team or to any game she’s played in. Never.”The Wolves (27-3) are in the state semifinals for the 16th straight year. They meet St. Francis (25-3) at 6 p.m. Saturday on the campus at the University North Georgia with a berth in the Class A-Private championship on the line.The program is a gold standard in Georgia with 13 state championships in the last 16 years and Azar has developed many elite players. More than that, though, she’s adapted the systems to the personnel. The one thing that won’t change is the effort level Azar expects from the players, and Weaver has been a perfect example, even before she broke into the starting lineup as a junior.“I’m sure if I told stories of myself back in the day, I would say I was the greatest offensive player on the planet when really I was a terrible shooter,” Azar said with a smirk. “But my trademark was defense and I think that’s why I hold her in such high regard. That’s kind of what Wesleyan basketball has been built on and it’s kind of in my personality.”Azar expends a lot of energy on the sidelines and it shows after games.“Sometimes I come away thinking I’m more drained than the players,” Azar said. “With Callie, she’s a player I don’t ever feel like I come away from the game and I’ve worked harder than she has.“I think it stems from her personality, but I think it’s also a product of having to because when she was younger, she was not the most skilled player. She had to find her way on the court. 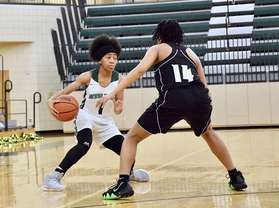 She found her way onto the court by going harder than anyone else.”Azar saw the potential when Weaver was in sixth grade and nurtured that belief in the teenager. Azar gave Weaver the confidence in her game before she really had a game.“Don’t get me wrong, Callie wasn’t this terrible player, but when she started in our program, she in no way stood out,” Azar said. “Except for the fact that she played hard. The hustle was always there and she was extremely coachable.”Weaver remembers Azar pulling her aside. And her incredulity.“Have you seen me dribble?” Weaver asked.“But I love the hustle and I knew if she bought in, the rest would come,” Azar said.The awe and love echo in Weaver’s voice as she talks about what Azar was able to see in her as a 13-year-old.“She’s incredible in the way she sees things before they’re even formed,” Weaver said. “Hearing that from her, I remember thinking, ‘Really? You think I can do half of what Jameson (Kavel) does? Are you kidding?’ She said, ‘I know you can do this.’ Hearing that, it almost pushes you because she believes in me so I believe in myself.“She saw what I could be before I even knew what I could be capable of.”Weaver chipped away methodically at improving her offensive skills.One of the things Azar so admires about the 17-year-old is she didn’t expect it to happen overnight.“She’s a product of buying into a system,” Azar said. “Callie knows what we want, she follows that plan and I believe it brings out the best in her.“As you watch her over the years, she follows the plan and she’s really bright. She’s got a high basketball IQ so she knows what she can and can’t do. She does what she can do and does it really well. 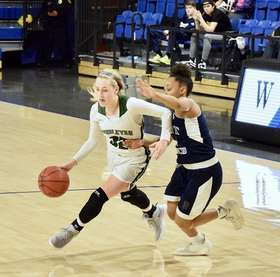 Callie has bought into that as well as any player I’ve ever had.”Weaver has hit 41 3-pointers for the Wolves this season and is shooting over 30 percent. Her poise and understanding of the system also show in the number of assists she’s racking up as a senior. In Wesleyan’s two playoff wins, Weaver has 14 assists playing the 3. 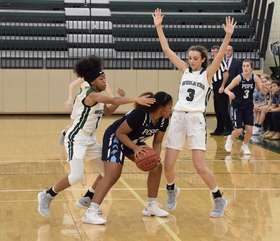 She’s also filled in for Paige Lyons at point guard when needed.“These girls are like family and with family comes this desire to make them look better than yourself — every play, every single time,” Weaver said. “For myself, and for this team, my mission has been to be positive and to be affirming and always push myself in practice and make myself an example. So there’s never a question in anyone’s mind of how hard I work or what my goals are. 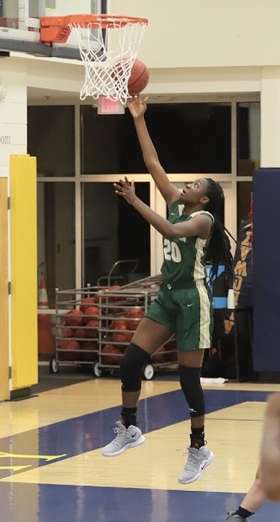 This team needs a leader that is consistent.”She and Azar work every day after practice on her shot.“Her ability to see the court is night and day from last year,” Azar said. 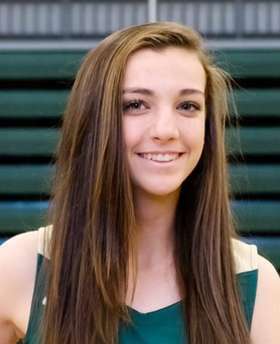 “Her offseason goal was to be able to handle the ball and see the court. It also speaks to her unselfishness.“She’s hit her stride. She’s the best Callie she can be in her senior year. 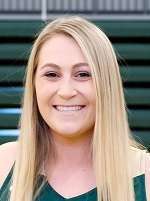 She’s done that as well as anyone we’ve had in our program.”Weaver admits to bias but is sure she couldn’t have become this player anywhere else.“There’s no way,” Weaver said emphatically. “Yes, it is incredible basketball and you get pushed in so many aspects, but beyond that, I mean, we watch the ‘Bachelorette’ at her house on Monday nights.“Her desire is for you to be the best basketball player you can be but also to leave here and be the best possible person you can be. That’s why they push us. It teaches you determination and purpose.”When Weaver leaves, it won’t be to further her basketball career. She could have played in college, but after deep introspection, realized that’s not what she is meant to do.“It was one of the hardest decisions I think I’ve ever made,” Weaver said. “I didn’t know what I wanted to do so you want to give yourself that option. I worked all the way through junior year of AAU and I thought about it over the summer.”Talking it through with her parents, Weaver came to terms with there being a different path for her.“I love this game,” Weaver said. “I’ve played it my entire life and it’ll always be a part of who I am. This place and this program will always be a huge part of who I am and why I am who I am.“It was my decision and it was super hard with lots of tears. It’s very surreal now knowing every game counts and every moment matters. It’s emotional and it was a very, very hard decision for me. I can’t even think about it. Not yet.”Weaver hopefully has two more games to play for Wesleyan, a name she cherishes seeing on the front of her jersey.“For all the people out there who know the Mikayla Coombs of the world and the Katie Frerkings, don’t miss out on the Callie Weavers because we couldn’t do what we did this year without her on the court,” Azar said. plWesleyan travelled to Gainesville to take on No. 5 ranked Lakeview Academy and came away a 76-51 winner in the quarterfinals of the Class A state tournament Tuesday night. The host Lions stayed with the Lady Wolves for a quarter as Wesleyan led 19-13 at the end of one. Wesleyan then upped the defensive pressure while feeding the low post on the offensive end of the floor. Post players Izzy Larsen, Alyssa Phillip and Jessie Parish all made significant contributions in the first half and specifically in the second quarter. Wesleyan outscored Lakeview 24-5 in the period taking a 43-18 lead into halftime. The teams scored evenly in the second half as all Wesleyan players saw plenty of playing time. AC Carter was Wesleyan's leading scorer despite having to sit a good portion of the first half after picking up two first quarter fouls. She had 21 points while also leading the team in rebounds with eight. Larsen had a very strong game down low putting up 16 points to go with five rebounds and two assists. 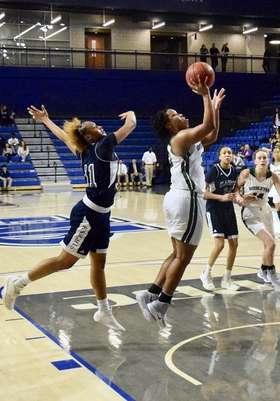 Phillip added eight points, five rebounds and two assists while Nicole Azar had seven points, three rebounds and two assists for the Lady Wolves. Callie Weaver put up six points and six assists. Paige Lyons added six points, three assists and three steals while Parish had six points, and six rebounds. Kaylynn Kirklen chipped in four points and two rebounds while Sade Ojanuga had two points and two rebounds. With the win, Wesleyan advances to the semifinal round of the state tournament for the 16th straight season, having made it this far every year since 2003. The Lady Wolves are now 27-3 on the season while Lakeview, the Region 8-A champion, finishes its season at 24-5. Wesleyan will face the winner of the quarterfinal match between St. Francis and Eagle's Landing Christian. Tipoff is Saturday at 6:00 PM at the Universithy of North Georgia in Dahlonega. 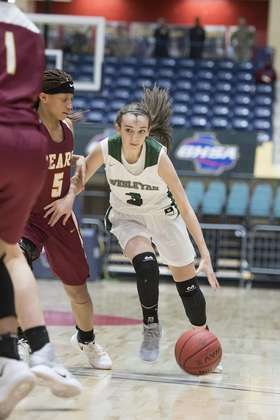 Having earned a bye in the first round of the state tournament, Wesleyan had a long layoff since the region tournament championship game 11 days ago. 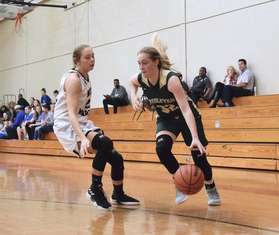 It wasn't evident however as the Lady Wolves overwhelmed Savannah Christian 75-23 in the second round of the 2019 Class A State Tournament. After the long five hour drive from Savannah, the Lady Raiders were on the wrong end of a 24-6 first quarter. Wesleyan then outscored Savannah Christian 21-6 in the second taking a 45-12 lead into halftime. The lead grew to 69-23 at the end of the third quarter. The fourth quarter was shortened to six minutes. All Wesleyan players saw plenty of playing time throughout the game. AC Carter led all scorers with 22 points to go with seven rebounds, two steals and one assist. Nicole Azar put up 13 points, three assists and two steals while Paige Lyons had 12 points, five assists, four rebounds and one steal. 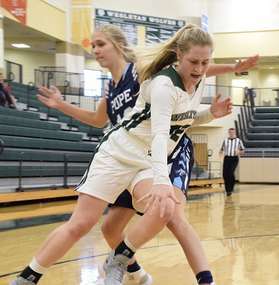 Callie Weaver added eight points, a game high eight assists, two steals and one board while Izzy Larsen had six points, six rebounds, two steals and one assist. Jessie Parish added six points, three boards and three steals while Kaylynn Kirklen had two points and one rebound. 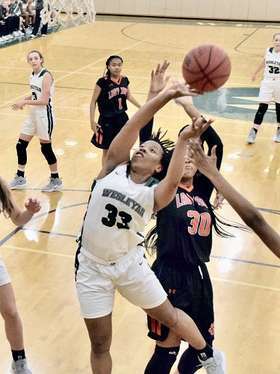 Sade Ojanuga chipped in two points and five boards for the Lady Wolves who advance to the quarterfinals of the state tournament for the 19th straight year. With the win, Wesleyan improves to 26-3 on the year. Savannah Christian ends its season at 20-10. Wesleyan will next face the winner of the second round game between Lakeview and Darlington which is scheduled for tomorrow night. If Darlington wins, Wesleyan will host the quarterfinal game. If Lakeview wins, Wesleyan will travel to Gainesville to take on the Lions. Game time, date and opponent to be announced. Holy Innocents won the Region 5-A tournament championship with a 72-50 win over Wesleyan at Wesleyan tonight. The Lady Bears raced to a 10-0 lead to start the game before Wesleyan finally found the basket. The Lady Wolves then seems to get into gear outscoring Holy Innocents 18-10 to close the gap to just two points at the end of the first quarter at 20-18. Wesleyan tied the game early in the second but Holy Innocents was able to stretch the lead to 38-30 at halftime. Holy Innocents outscored the Lady Wolves 15-8 in the third quarter increasing their lead to 53-38 heading into the fourth. Things got worse from there. Wesleyan was plagued with foul trouble for the entire game as Holy Innocents was enjoyed free reign in the paint. Callie Weaver and Nicole Azar both fouled out while Paige Lyons and Izzy Larsen played much of the game with four. 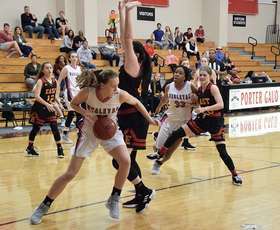 Wesleyan had no answer for Holy Innocents' 6'5 Jillian Hollingshead as she was able to grab numerous rebounds for putbacks despite being boxed out. Perhaps this loss will be motivation entering the state tournament as the team did not play up to its abilities tonight. AC Carter was the exception as she led all scorers with 32 points, four rebounds and four steals. Weaver had seven points, two rebounds and two steals while Lyons had five points, two assists and one steal. Azar added three points, two rebounds and two steals while Larsen put up two points, two rebounds and one steal. Wesleyan as a team only had 12 rebounds and six assists. Those numbers will have to improve if they enter the state tournament. Holy Innocents improves to 21-7 with the win while Wesleyan drops to 25-3. Up next is the state tournament. Brackets will be posted as soon as the dates, times and matchups are posted. No. 1 ranked Wesleyan handily defeated No. 5 ranked Eagle's Landing Christian 77-41 Friday night in the semifinals of the Region 5-A tournament at Wesleyan. The Lady Wolves that showed up tonight hardly resembled the team that defeated Greenforest by 12 on Wednesday...thank goodness. Wesleyan was crisp and focused from the outset. They overwhelmed ELCA in the first quarter racing to a 24-9 lead at the end of the first quarter. The Lady Wolves outscored ELCA 16-10 in the second to take a 40-19 lead into halftime. Wesleyan didn't miss a beat in the second half. The team continued sharing the ball nicely and finding the open man. Wesleyan outscored the Lady Chargers 24-15 in the third quarter and 13-7 in the fourth posting a 36-point win over the No. 1 seed from the South Subregion. AC Carter led all scorers with 24 points to go with eight rebounds, three assists and three steals. Nicole Azar scored 14 points and was a perfect 4-for-4 from behing the three point line. She co-led the team in assists with six and also had two rebounds. Callie Weaver had 12 points, six assists and two steals while Paige Lyons added 10 points, four assists, two boards and a steal. Izzy Larsen put up nine points, four rebounds, one steal and one assist. Alyssa Phillip chipped in four points while Sade Ojanuga and Jessie Parish added two points apiece. Wesleyan ups its record to 25-2 with the win while Eagle's Landing Christian drops to 20-4. The Lady Wolves next face No. 2 ranked Holy Innocents in the region championship game for the fifth straight year. Holy Innocents was a 65-51 winner over Landmark Christian in its semifinal game. Tipoff is 5:00 PM tomorrow at Wesleyan. 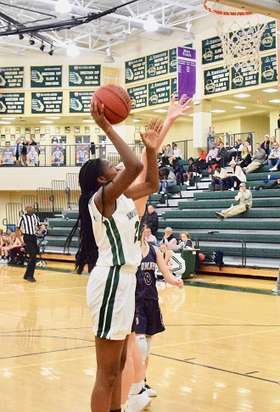 Congratulations to Wesleyan junior AC Carter for being voted Subregion 5-A North Player of the Year by the region coaches. Sophomore Paige Lyons was named First Team All Subregion. Named All Subregion Honorable Mention were Nicole Azar, Izzy Larsen, Alyssa Phillip and Callie Weaver. Congrats to each player! It wasn't pretty, far from it. But a win is a win. 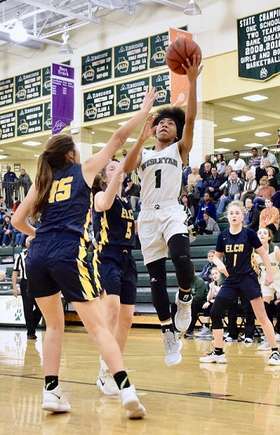 After a nine-day layoff since the regular season ended, Wesleyan defeated Greenforest in the quarterfinals of the Region 5-A Tournament tonight at Wesleyan. Wesleyan led 13-9 at the end of the first quarter and stretched the lead to 28-19 at halftime. Greenforest started the second half in a stall. 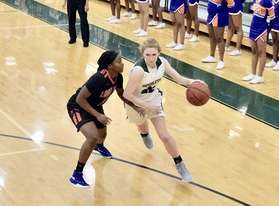 The already lethargic Lady Wolves practically drifted into a catatonic state as Greenforest slowly chipped at the Wesleyan lead. Wesleyan did not score its first points of the second half until the three minute mark of the period. Greenforest opened the period on a 14-2 run taking a 33-30 lead with under three minutes to play in the third. 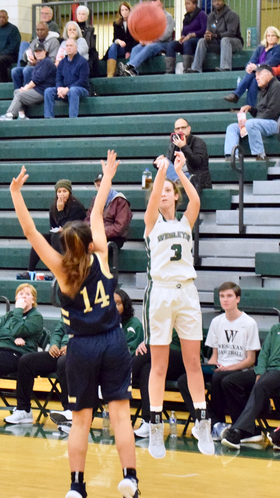 Nicole Azar hit a three pointer from the top of the key to tie the game and then gave Wesleyan the lead for good on the next posession making one of two free throws to give the Lady Wolves a 34-33 lead. Wesleyan led 38-34 heading into the fourth quarter. AC Carter had a traditional three point play early in the fourth extending Wesleyan's lead to 42-35 creating some separation, and Greenforest never again threatened. Wesleyan outscored Greenforest 17-9 in the fourth. Hopefully this was a wake up call that they can't just show up and win. The team has to execute as coached in practice and play as one unit. Carter and Paige Lyons and led the Wesleyan scoring effort putting up 16 points apiece. Carter also had six rebounds, three steals, and two assists while Lyons had four steals, two assists and two rebounds. Azar added 11 points, two steals, one assist and one board while Callie Weaver had six points, four rebounds, on assist and one steal. Izzy Larsen chipped in four points and a team leading 10 rebounds along with four steals and two assists. Alyssa Phillip added two points, three rebounds and a steal for the Lady Wolves who improve to 24-2 on the season. Greenforest falls to 18-6. Wesleyan, the No. 2 from the 5-A North Subregion, will face Eagle's Landing Christian, the No. 1 seed from 5-A South in the region tournament semifinals. Eagle's Landing Christian (20-3) was a 63-41 winner over Galloway in its quarterfinal. Tipoff is Friday at 6:30 PM at Wesleyan. Due to the possibility of wintry weather tomorrow, the final regular season game was moved to today. The Lady Wolves travelled to Sandy Springs to take on Mt. Vernon and defeated the Mustangs 85-20 in a region contest. Mt. Vernon led 6-5 early before Wesleyan closed out the first quarter on a 14-2 run. Wesleyan rolled after that leading 55-17 at the half and outscored Mt. Vernon 30-3 in the second half. Nicole Azar led the scoring effort for the Lady Wolves with 23 points and shot 50% from behind the arc on 5-for-10 shooting. She also led the team in steals with five and had three assists and a rebound. Alyssa Phillip put up 18 points, eight rebounds, two assists and two steals for Wesleyan. Paige Lyons seems to be regaining her legs after being out three weeks nursing an injury. She had 13 points, four boards, three assists and one steal. Callie Weaver added 10 points, a team-high nine assists and a team-high tying five steals. 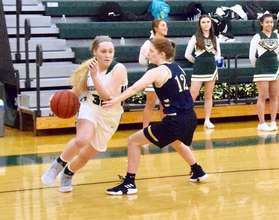 Izzy Larsen had eight points, four steals, four boards and two assists while Jessie Parish put up six points, four boards, four steals and three assists. Teagan Wilkenloh added five points, two rebounds and a steal while Imani Washington had two points, two assists and two rebounds. Wesleyan completes the regular season with a record of 23-2, 6-1 in region play. The Region 5-A tournament will be held next week at Wesleyan. 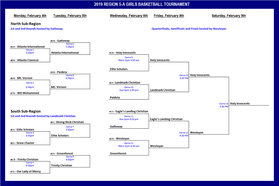 The Lady Wolves will next take the court on Wednesday, February 6. Opponent and game time to be determined. Class A No. 1 ranked Wesleyan headed up Buford Highway this afternoon to take on the Class AAAAA No. 1 ranked Buford for the annual Battle of Wolves in Gwinnett County. The Lady Wolves of the Kelly green defeated the Lady Wolves of the Hunter green 54-52 in a physical, hard fought game. Wesleyan got itself in a deep hole early on. Buford connected on four three pointers in the first quarter en route to a 17-5 lead at the end of the period. 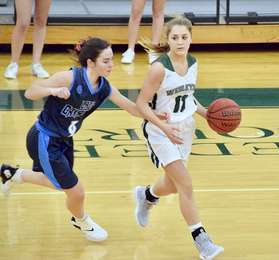 Wesleyan righted the ship in the second quarter. They opened the period on a 14-5 run to cut Buford's lead to just 22-19 at the 4:49 mark. Buford then closed the secord quarter on a 10-6 run taking a 31-25 lead at halftime. Bufords's lead grew to 10 midway through the third quarter at 37-27 but a Callie Weaver three pointer got it back to seven. Wesleyan continued to chip away at the lead cutting it to just 46-43 at the end of the thrid period. The teams battled in the fourth quarter. 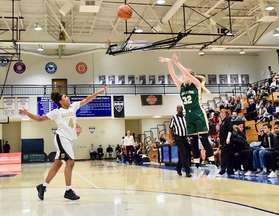 With Buford leading 52-47, Nicole Azar connected on a corner three cuting the lead to 52-50 with 1:14 left to play. After a defensive stop, AC Carter penetrated and dished to Izzy Larsen who hit layup to tie the game at 52-52 with just under a minute to play. Buford had the ball and worked clock down before driving the lane but missed the layup. Buford got the rebound and putback however and scored with just 2.1 seconds remaining. Wesleyan called timeout but a halfcourt heave by Carter hit the backboard. Game over. It was a hard fought battle between two good teams and will be good preparation for each team as they prepare to enter their respective state tournaments. Carter and Azar lead Wesleyan in scoring with 13 points apieice. 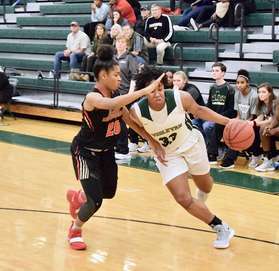 Carter also had nine rebounds, four assists and two steals while Azar connected on three three pointers on the night and also had four steals. Weaver had 11 points...including three threes, as well as three rebounds and an assist. Larsen added nine points, six boards and one assist while Paige Lyons played for the first time since injuring her ankle three weeks ago. She had four points and a game high six assists. Wesleyan drops to 22-2 with the loss while Buford ups its record to 21-2. Wesleyan returns to region play on Tuesday as they'll play their final game of the regular season. They'll face Mt. Vernon in an away game. Tipoff is 5:30 PM. 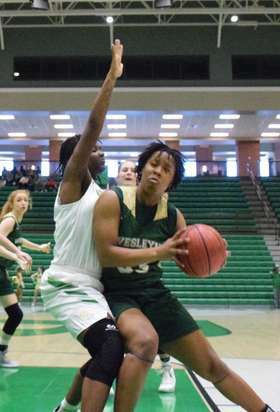 Wesleyan began the regular season home stretch with an 85-37 region win over Galloway Tuesday night at Galloway. The Lady Wolves posted leads of 20-10 at the end of the first quarter and 41-17 at halftime. The lead grew to 67-31 entering the shortened six-minute fourth quarter. All Wesleyan players saw playing time in this one. Sophomore Alyssa Phillip led Wesleyan in scoring with a career high 21 points to go with six rebounds, three steals and a blocked shot. AC Carter had another double-double pouring in 20 points while grabbing 15 rebounds. She was a perfect 6-for-6 from the freet hrow line and also had seven assists and four steals. Nicole Azar scored 16 points on 44% shooting from behind the three point line going 4-for-9. She also had three steals, three boards and two assists. Jessie Parish added 10 points, eight rebounds and two steals while Izzy Larsen had six points, five boards, four steals and four assists. Callie Weaver again did a nice job running the point while Paige Lyons continues to recover from her ankle injury. Weaver again led the team in assists with eight while scoring four points. Kaylynn Kirklen added four points, one rebound and one assist while Sade Ojanuga chipped in two points and one MONSTER blocked shot. Imani Washington rounded out the Wesleyan effort with two points, a rebound and an assist. The Lady Wolves improve to 22-1 overall, 5-1 in region action while Galloway drops to 10-10, 2-2. Up next is the annual battle of Wolves as Class A No. 1 Wesleyan takes on Class AAAAA No. 1 Buford. The two sets of Wolves will face off on Saturday at 2:30 PM at Buford. 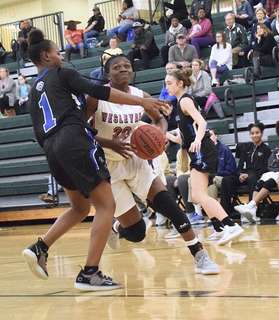 Wesleyan didn't have much time to stew about last nights tough five-point loss to Holy Innocents before getting back on the court for an early afternoon game with Class AAAAAAA Centennial Saturday in a non-region game. The Lady Wolves bounced back nicely with a 70-31 blowout of Centennial at Yancey Gymnasium. Wesleyan got out to an early lead getting up 16-7 at the end of the first quarter. The lead grew to 35-13 at halftime aided by four first half three pointers by Nicole Azar. Centennial battled in the third quarter outscoring Wesleyan 15-10 in the period cutting the lead to 45-28 at the end of the period. Wesleyan opened the fourth quarter with a 10-0 run putting to rest any thoughts of a comeback by the Lady Knights. The highlight of the afternoon was the 1000th career point scored by junior AC Carter in the first quarter. She becomes the 15th Wesleyan player to reach the 1000 point milestone. 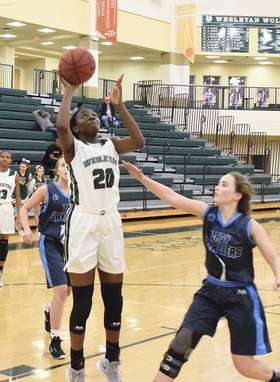 Azar led the scoring effort for the Lady Wolves as she dropped 23 points on Centennial to go with four rebounds. Izzy Larsen put up a double double with 15 points and a whopping 19 boards and four assists. Carter added a few more points to her 1000 as she put up 13 to go with four rebounds, four steals and three assists. Alyssa Philip had nine points on 7-for-8 shooting from the free throw line. She also had eight rebounds and three steals. Jessie Parish added six points, three rebounds and two blocks while Callie Weaver did a nice job stepping in at point guard. She dished a game high seven assists while grabbing four rebounds. Sade Ojanuga and Kaylynn Kirklen both chipped in two points apiece for Wesleyan who ups its record to 21-1 on the season. Centennial drops to 11-10. This was the last regular season home game for the Lady Wolves who will return to region competition as they face Galloway on Tuesday night. Tipoff is 6:00 PM at Galloway. In their first meeting since last season's state championship game Holy Innocents came to play and Wesleyan was flat. The Bears raced to an early 7-0 lead which set the tone as Wesleyan spent the entire game playing catch up. Holy Innocents led 19-12 at the end of the first quarter. Holy Innocents upped its lead to 11 before the Lady Wolves cut it back to seven at 36-29 at the half. 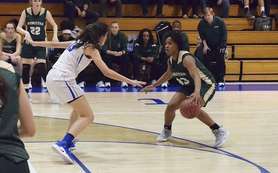 The teams played evenly in the third quarter which didn't help Wesleyan's cause as they needed to cut in to Holy Innocents' lead. The Bears led 52-43 heading into the fourth quarter. Wesleyan cut the lead to four midway through the fourth but couldn't get any closer. Junior AC Carter came to play as she scored a career high 33 points. in addition to leading the team in scoring, she led in assists with four and rebounds with six. Nicole Azar had nine points, two steals and one assist. Jessie Parish also had nine points to go with five rebounds and two steals. Callie Weaver added seven points, an assist, a steal and a charge. Izzy Larsen chipped in five points, four rebounds and two assists. Wesleyan drops to 20-1, 4-1 in region with the loss while Holy Innocents improves to 12-7, 5-0. Wesleyan must put this tough loss behind them quickly as they have a 2:30 PM game at home tomorrow vs. Centennial. 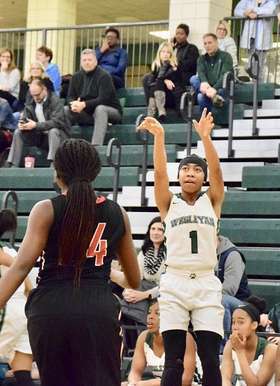 Wesleyan posted a 78-9 win over Atlanta Classical Academy in a Region game Tuesday night at Wesleyan. All players saw playing time in the first ever meeting between the schools. Atlanta Classical, founded in 2014, is in its first season of varsity competition. AC Carter had a double double with 19 points and 10 assists to go with six rebounds and three steals. Nicole Azar had 17 points, three assists and two steals while Alyssa Phillip had 13 points, seven rebounds and four steals. Kaylynn Kirklen added 10 points and two assists while Callie Weaver scored eight points and had a team high 11 assists. Izzy Larsen chipped in seven points, four boards, and two assists. 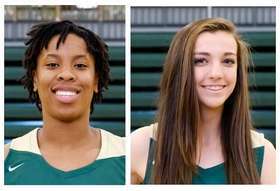 Jessie Parish added two points, a game high five steals, and four rebounds while Sade Ojanuga had two points and four rebounds for the Lady Wolves who improve to 20-0 overall, 4-0 in region play. Up next will be the biggest test from a region opponent so sar this season as No. 2 ranked Holy Innocents visits Yancey Gymnasium. Tipoff is 7:00 PM Friday night. 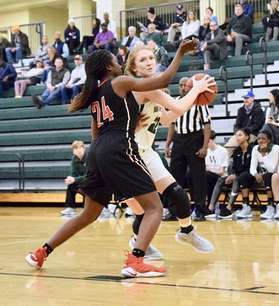 With junior AC Carter doing it underneath and sophomore Nicole Azar taking care of it from the outside, Wesleyan turned a five-point halftime deficit into a 21-point rout over previously unbeaten North Cobb Saturday monring in the first game of the Krossover Classic hosted by Archer High School. 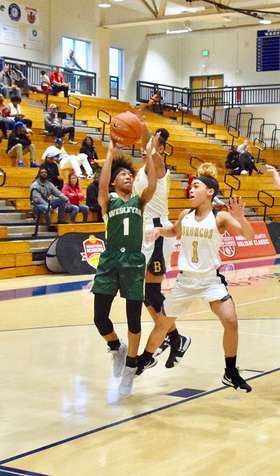 The Krossover Classic is one of numerous one-day showcases pitting good teams against one another as college coaches attend to scout players with their high school teams as opposed to during the AAU season. Game 1 on the day didn't dissapoint. It pitted two teams, highly ranked in their respective classifications, sporting identical 18-0 records. Class A No. 1 ranked Wesleyan took the first quarter sporting a 12-10 lead at the end of the period. Class AAAAAAA No. 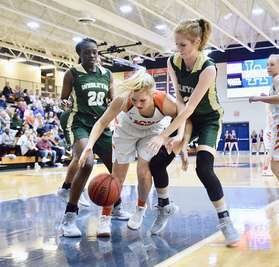 3 ranked North Cobb turned things around in the second period outscoring Wesleyan 16-9 taking a five-point advantage into halftime leading 26-21. The Lady Wolves made adjustments at halftime and came our roaring...that would be if Wolves actually roared...how about howling? Either way, Wesleyan completely smothered the Lady Warriors from Kennesaw in the second half. 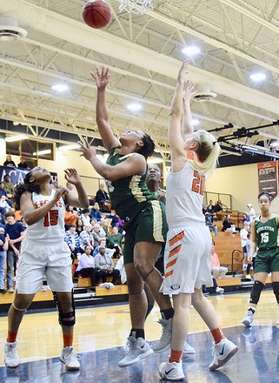 The Lady Wolves outscored North Cobb 21-6 in the third quarter and 17-6 in the fourth. The rout over their highly regarded counterparts from the state's largest classification was complete. 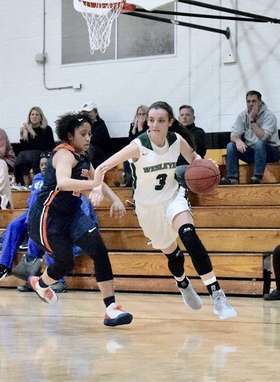 The big win came as Wesleyan played without super soph point guard Paige Lyons who continues to nurse an ankle injury. Carter led the Wesleyan scoring effort with 27 points. She was able to get to the rack drawing numerous fouls. She shot 81% from the free throw line on 9-for-11 shooting. Carter also had nine rebounds...all on the defensive end, three assists and two steals. 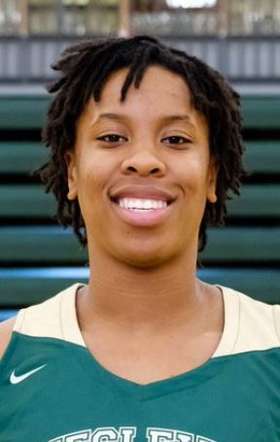 Azar was the other Wesleyan player to score in double figures as she put up 22 points while canning six three-pointers. She also led the team in steals with four while grabbing two boards and dishing two assists. Sophomore Alyssa Phillip cleaned the glass for the Lady Wolves as she pulled down a game high 11 rebounds. Junior Izzy Larsen scored four points, grabbed seven boards and led the team in assists with five. Freshman Jessie Parish added four points and two rebounds while lone senior Callie Weaver did a nice job stepping in at point guard. She had four rebounds, three assists, two points, a steal and took a charge. This was an impressive win for Wesleyan over a highly ranked team from a much larger classification...and without its starting point guard. The Lady Wolves improve to 19-0 on the year while handing North Cobb it's first loss of the season as they drop to 18-1. The Lady Wolves return to region play on Tuesday as they'll face Atlanta Classical Academy in the first ever meeting between the schools. Tipoff is 5:30 PM on Tuesday at Wesleyan. 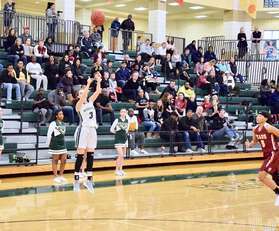 Wesleyan travelled to Decatur and took care of fifth ranked Paidea 58-33 in a region raod win at Paideia on Friday night. 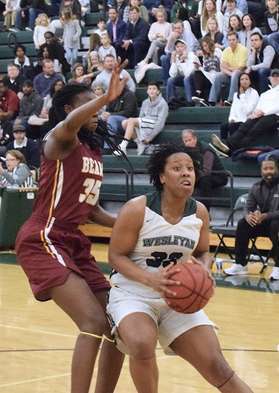 Although sloppy and plagued with foul trouble for multiple players, Wesleyan built leads of 13-7 at the end of first quarter and 32-9 at halftime. Benefitting from a 9-2 discrepancy in fouls called in the third quarter in Paideia's favor, the Pythons were able to close the gap to 43-28 heading into the fourth. Wesleyan then essentially shut Paideia down in the fourth outscoring the Pythons 15-5 and was simply happy to get out unscathed with their third region win of the season. AC Carter had a good night leading Wesleyan in four categories including having double double scoring 16 points while pulling down 17 rebounds. She also led the team in assists with six and blocks with three. Izzy Larsen had 15 points, eight rebounds, three steals and two assists while Alyssa Phillip added 11 points, four rebounds, two assists and a blocked shot. Nicole Azar chipped in nine points, three streals and a block while Jessie Parish added four points, five boards and two steals. Callie Weaver added three points, and two assists for Wesleyan which remaings undefeated at 18-0, 3-0 in region. Paideia drops to 14-2, 2-1. Up next for the Lady Wolves, a duel with Class AAAAAAA No. 3 ranked North Cobb. It will be a battle of unbeatens as both teams are 18-0. Tipoff is 11AM tomorrow at Archer High School. 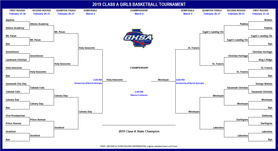 The first Georgia High School Association state tournament for girls basketball was held in 1945, 74 years ago. The first few years there were two classifications in Georgia. 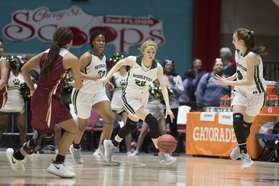 As time went on, more and more classifications were added and there are now a total of eight as public and private schools are divided for state tournaments for girls basketball. A total of 334 state championships have been won by 157 different schools. 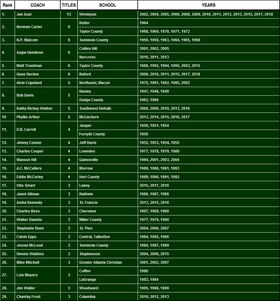 Wesleyan has won more state titles (13) than any school in Georgia history regardless of classification. The Wesleyan program has only completed 21 seasons of basketball at the varsity level. Below is a comprehensive list of all girls basketball state championships won in every classification since competition began in 1945. Wesleyan had no trouble with WD Mohammed in a 79-20 road win Tuesday night. Freshman Jessie Parish led the scoring for Wesleyan with a career high 15 points on 6-for-9 shooting from the floor and a perfect 3-for-3 from the free throw line. She also had five rebounds and two assists. 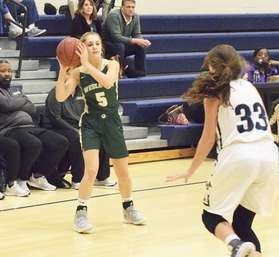 Nicole Azar had 14 points, three assists and two steals for the Lady Wolves while Izzy Larsen added 11 points and nine rebounds. AC Carter put up 10 points, four assists and three rebounds while Alyssa Phillip chipped in nine points, six rebounds, two steals and one assist. Callie Weaver also had nine points, a team high eight assists and five steals. 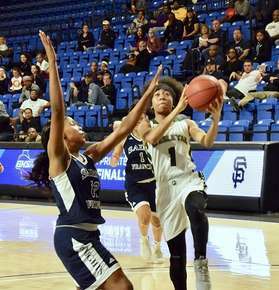 Imani Washington was the third Wesleyan player to put up nine points while she grabbed three boards and had one steal. Kaylynn Kirklan added two points, three rebounds, two assists and one steal. Wesleyan improves to 17-0, 2-0 in region with the win. They will next face No. 7 ranked Paidea in another road game. Tipoff is 7:00 PM at Paideia. 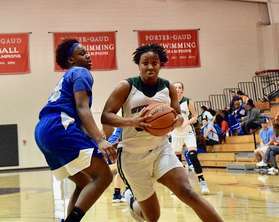 Wesleyan took on Dillard (FL) Saturday night in the "She Got Game Classic" at McEachern High School and came away with a hard fought 63-57 win. 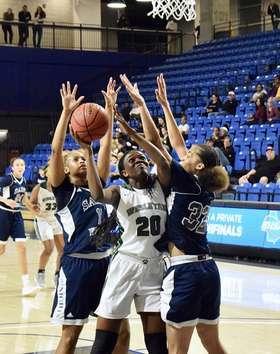 The win was especially sweet as the Lady Wolves got to avenge a tough two-point loss to Dillard which occurred at the Nike Tournament of Champions in Phoenix in December 2015 in the team's only previous meeting. The only member of the team who was on that squad was senior Callie Weaver who was a freshman at the time. She made her presence known early on as she hit a three pointer to start things off for Wesleyan. She and Nicole Azar combined for five first quarter three pointers between them, assisted by some nice dishes by Paige Lyons, helping Wesleyan gain a 21-16 lead at the end of the first quarter. 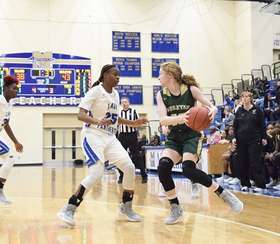 The crisp ball movement and rebounding that was so prevalent in the first quarter for the Lady Wolves, disappeared in the second quarter. Dillard's sharp shooting guards Kintaeja Ling and Genovea Johnson, heated up as the duo combined for several three pointers in the period. 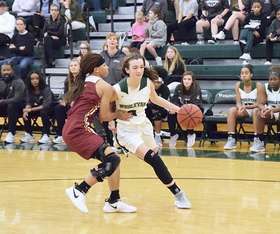 The combination of the Lady Wolves moving away from what got them their first quarter lead, and the Lady Panthers' outside game, was reflected on the scoreboard. Dillard, ranked No. 2 in Class AAAAAAA in Florida, outscored Wesleyan 17-7 in the period taking a 33-28 lead into halftime. Halftime adjustments were made. Wesleyan changed up its defense and isloated the two Dillard guards essentially shutting them down from long range. Wesleyan turned a five-point halftime deficit into a four-point lead as they outscored Dillard 19-10 in the third quarter, taking a 47-43 lead into the fourth. The Wesleyan lead grew to as much as 11 in the fourth quarter at 58-47 with about two minutes left in the game. That's when Lyons tweaked her ankle after landing on a Dillard player's foot while attempting to block her shot. She had to exit the game and Dillard upped its defensive pressure. They were able to cut the lead to three points at 60-57 late but AC Carter sealed the win with free throws to the game on ice. All five Wesleyan starters scored in double figures as the Lady Wolves scoring attack was well balanced. Azar led the Wesleyan scoing effort with 13 points. She was 4-for-6 from behind the three-point line and also had two rebounds and one assist. Carter scored 12 points and had six rebounds, four assists and two blocked shots. Weaver, Lyons and Izzy Larsen each scored 11 points. Lyons was Wesleyan's assist leader with nine as she narrowly missed a double double. Lyons also had four boards and two steals. Weaver was 3-for-6 from the three point line and also had three boards, an assist and a steal. Larsen put up a double double as she had 11 rebounds to go with her 11 points and also had two assists and a steal. She was named the game's Most Valuable Player. 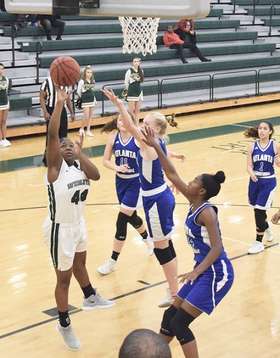 Alyssa Phillip added five points, two boards and a blocked shot for the Lady Wolves who improve to 16-0 on the year as Dillard falls to 11-3. Dillard will head home to Ft. Lauderdale while Wesleyan goes to back to region play on Tuesday as they travel to WD Mohammed to take on the Caliphs. Tipoff is 5:30 PM. Wesleyan had no trouble in its region opener posting a 91-28 win over Atlanta International at Wesleyan. On a night when highly decorated former Lady Wolves Holli Wilkins ('12) and Katie Frerking ('13) were inducted into Wesleyan's Circle of Honor, the current team made quick work of the visting Eagles from AIS. Every Wesleyan player entered the scoring column tonight led by Page Lyons. The sophomore point guard scored 21 points to go with four assists and four steals. AC Carter had 14 points, a team high eight steals, six assists and three rebounds. Nicole Azar put up 13 points, a game high seven assists and five steals, while Callie Weaver had 12 points, five assists and three steals. Izzy Larsen added nine points, a team high seven rebounds, four assists and three steals. Jessie Parish chipped in seven points and five boards while Alyssa Phillip put up six points and five boards. 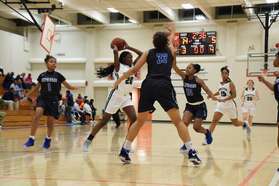 Kaylynn Kirklen, Imani Washington and Sade Ojanuga scored four, three and two points respectively. The Lady Wolves are are now 15-0 on the season, 1-0 in region action, with the win. AIS falls to 7-5, 2-2. Wesleyan next faces Dillard, out of Ft. Lauderdale, tomorrow night. Tipoff is 5:00 PM at McEachern High School. 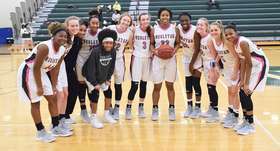 It wasn't the prettiest game but in the end, Wesleyan got the job done as they won the Carolina Invitational posting a 51-35 win over Bullitt East (KY) in the championship game at Porter Gaud School in Charleston. The teams exhanged leads in the early going. Bullitt East led 7-5 before back to back three pointers by Nicole Azar gave Wesleyan a little breathing room at the end of the first quarter, taking an 11-7 lead. The Lady Wolves then outscored Bullitt East 14-11 in the second quarter 25-18 lead into halftime. As the game wore on, the Lady Wolves upped its lead ever so methodically behind solid defense and good clock management. Wesleyan won the third quarter 11-8 to up the lead to double figures at 36-26 heading into the fourth. They put the game away with a 15-9 fourth to post the 15-point victory. Azar was Wesleyan's leading scorer putting up 13 points to go with two steals, two rebounds and an assist. Paige Lyons, who earned tournament Most Valuable Player honors, scored 10 points to go with three assists, three rebounds and two steals. Callie Weaver, who was named to the All Tournament team, scored eight points, had eight rebounds, three assists and took SIX CHARGES! Izzy Larsen put up eight points, six boards and four assists while AC Carter, who also made the All Tournament team, added six points, seven rebounds and two assists. Alyssa Phillip chipped in two points, four boards and two steals for the Lady Wolves who are now 14-0 on the season. 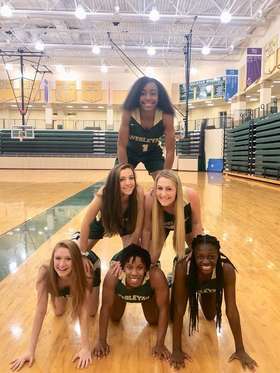 Wesleyan will take its last long break of the season as they won't take the court again until Friday when they face Atlanta International in their region opener. Tipoff is 5:30 PM at Wesleyan. Despite a double digit win over a previously undefeated team yesterday, Wesleyan only looked decent for one half. Today was a different story as the Lady Wolves manhandled North Marion (WV) 68-35 in their semifinal round game of the Carolina Invitational at Porter Gaud School in Charleston. 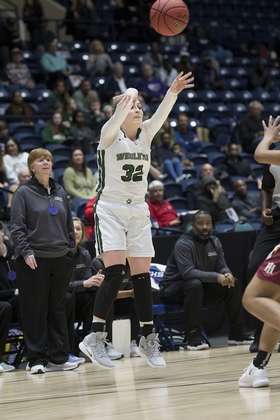 Wesleyan was a focused team for four quarters which resulted in a lopsided win over North Marion, the defending West Virginia Class AA state champions from Farmington. Similar to yesterday's game, Wesleyan jumped out to an early lead with a stifling full court press which created numerous turnouvers resulting in Wesleyan points. The Lady Wolves led 23-1 at the end of the first quarter. 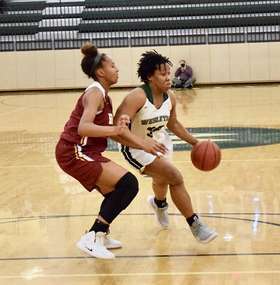 North Marion was able to settle in during the second quarter and played evenly with Wesleyan as the lead stayed at 22 points, Wesleyan leading 39-17 at the half. The damage had alrleady been done as Wesleyan outscored North Marion 29-18 in the second half. 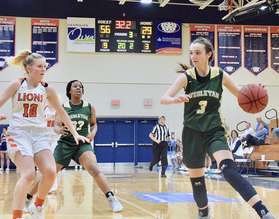 Sophomore Nicole Azar led the Wesleyan scoring effort with 23 points, connecting on five of eight three-point attempts. She also led the team in steals with four, and had three rebounds. Junior AC Carter narrowly missed a double double as she had 18 points and nine rebounds to go with five assists and three steals. Junior Izzy Larsen added nine points, five rebounds, four assists and three steals in a nice all around effort while sophomore Paige Lyons had eight points, five assists, three steals and two boards. Lone senior Callie Weaver chipped in six points, three rebounds and three steals while sophomore Alyssa Phillip had four points and three rebounds for Wesleyan which improves to 13-0 on the season. North Marion falls to 7-2. Wesleyan will face Bullitt East (KY) in the tournament championship game. Bullitt East, from Mt. Washington, Kentucky, narrowly defeated North Forsyth (GA) 43-42 in its semifinal game. Tipoff is 12:30 PM. 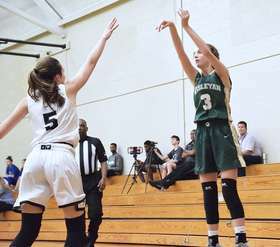 Perhaps a Christmas hangover was to blame as Wesleyan was far from sharp in a 53-38 win over Fort Dorchester (SC) in their first round game of the Carolina Classic hosted by Porter Gaud School in Charleston, SC. Oddly, the hangover didn't kick in until the second half. 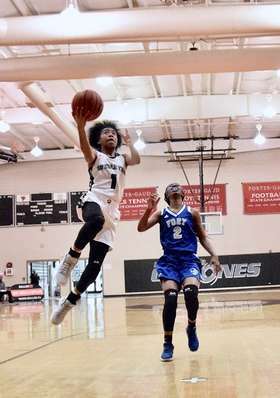 The Lady Wolves were in control from the outset as they raced to a 14-0 lead before Fort Dorchester, from North Charleston, finally got on the scoreboard. Wesleyan led 16-2 at the end of the first quarter. The lead grew to 29-9 at halftime. The Lady Wolves apparently felt contented in the second half as the game seemed put away but no one told Fort Dorchester's Taylor Bates. The diminutive guard for the Patriots connected on five second half three pointers. Fort Dorchester went on a 15-2 run cutting the Wesleyan lead to just 13 after it had grown to 26. That was as close at they would get however as Wesleyan posted the 15-point win. AC Carter led Wesleyan with 14 points, five rebounds, four steals and three assists while Paige Lyons had13 points to go with six assists. Nicole Azar added nine points, a blocked shot and a steal. Izzy Larsen led Wesleyan in rebounds with a monster 16 boards to go with four points and two assists. Callie Weaver chipped in seven points, three rebounds and two assists while Alyssa Phillip put up four points and four boards. The Lady Wolves improve to 12-0 with the win while handing Fort Dorchester its first loss of the year as they drop to 11-1. Up next is a meeting with North Marion (6-1) from Farmington, West Virginia. Wesleyan will have to play a complete game in order to win against a talented and disciplined North Marion squad. Tipoff is Noon tomorrow at Porter Gaud School. 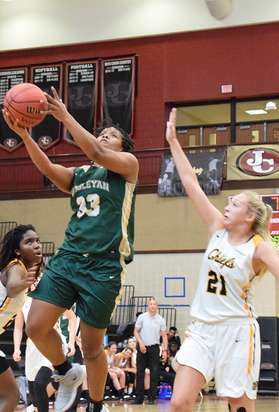 Wesleyan is off to its best start in school history as they posted a 72-37 win in their first ever meeting with South Cobb Saturday afternoon at Sequoyah High School. This is the first Wesleyan squad to start a season 11-0. Only once prior had a team even been 10-0. That was the 2010-2011 team. 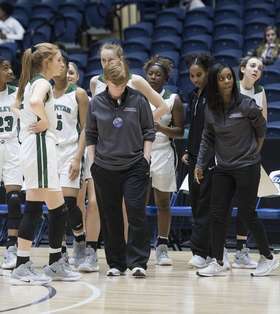 Assistant Coaches Taylor Blackmon and Brittany Stevens were sophomores on that team, which went on to win the Class A state title, its fourth straight. The Lady Wolves took control of the game early on racing to a 21-11 at the end of the first quarter. In the second quarter, Wesleyan did a nice job defensively on South Cobb, a AAAAAA school from Austell. 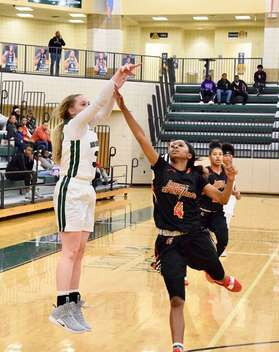 However, the Lady Wolves' offense sputtered while it lacked cohesiveness. Wesleyan won the second quarter 13-3 and headed into the locker room at halftime with a 34-14 lead. The Lady Wolves came out in the second half looking like a different team offensively. There was a lot more flow to the offense and nice, crisp ball movement. They increased their lead to 56-31 at the end of the third period and continued their good team play in the fourth as they posted the 72-37 win. Sophomore Nicole Azar led all scorers dropping 21 points on the Lady Eagles. Junior AC Carter narrowly missed a double double as she had 20 points and nine rebounds to go with five assists and four steals. Lone senior Callie Weaver put up 11 points, four assists, four steals and three rebounds while junior Izzy Larsen had nine points, eight boards, three steals and two blocks. Sophomore Paige Lyons led the team in assists and steals with seven and six respectively. She also put up six points and had four rebounds and two blocked shots. Freshman Jessie Parish added five rebounds, and two steals for the Lady Wolves. Wesleyan is now 11-0 on the season with the win and will have four days off to enjoy Christmas. The team leaves for Charleston, South Carolina on Wednesday as they'll compete in the Carolina Invitational Thursday, Friday and Saturday. Opponents and game times to be announced. Class A top ranked Wesleyan downed Class AAAAAAA No. 10 ranked Brookwood 58-40 Saturday night in the Hawks/Naismith Holiday Classic at Norcross High School. The third ever meeting between Wesleyan and Brookwood was different than the prior two meetings which took place in December 2012 and December 2013 respectively. The difference? Second-year Brookwood coach Carolyn Whitney is a 2006 Wesleyan grad who was point guard on Wesleyan's 2004, 2005 and 2006 Class AA state championship teams. In addition to playing for Coach Azar years ago, she was also and assistant coach at Wesleyan for five years until taking an assistant coaching job at Lambert for a year before becoming Brookwood's head coach last season. Once the ball was tipped, it was all business for both coaches. The Lady Wolves were sharp in the first quarter with crisp ball movement and presicion-like passing. Wesleyan opened up a double-digit lead at 20-8 at the end of one. Things settled down somewhat in the second quarter as Wesleyan only outscored Brookwood 11-7 taking a 31-15 lead at halftime. The Lady Broncos played Wesleyan evenly in the third quarter and could only shave one point off the lead. Wesleyan led 42-27 at the start of the fourth and outscored Brookwood by three to post the 18-point win. Wesleyan's lone senior Callie Weaver continued her consistent play as she led all scorers with 19 points to go with five rebounds, three steals and two assists. AC Carter recorded another double double scoring 15 points while pulling down 10 boards. She also had two assists and two steals. Izzy Larsen was the third Wesleyan player to score in double figures will 11 points, nine rebounds, three assists and three steals. Paige Lyons added nine points, six assists and two rebounds while Nicole Azar had three points, five assists and two boards. The Lady Wolves improve to 10-0 on the season, matching the best start to a season in school history. Only the 2010-2011 Lady Wolves had started a season 10-0. 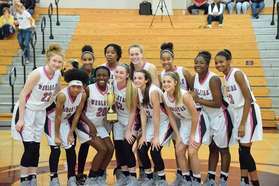 Coach Whitney is doing great things over at Brookwood and has her team ranked in the top 10 in Georgia's largest school classification. Brookwood, which has a win over Class A No. 2 ranked Holy Innocents earlier this season and a narrow two-point overtime loss to Class AAAAAAA No. 4 ranked Norcross, drops to 6-5 with the loss. Coach Azar, and protigee Whitney, exchanged a heartfelt hug after the game so their friendship remains in tact. The Wesleyan players will finish exams this week and then play one more game prior to Christmas. The Lady Wolves will face yet another Class AAAAAAA school as they take on South Cobb next Saturday at Sequoyah High School. Tipoff is 11:30 AM. Wesleyan defeated Cedar Shoals 69-51 Tuesday night in a mostly sloppy performance at Yancey Gymnasium. 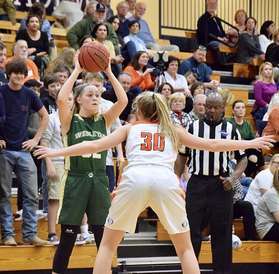 The first ever meeting between Wesleyan and Cedar Shoals saw the Lady Wolves hold leads of 17-10 at the end of the first quarter and 41-26 at halftime. The teams played mostly evenly in the second half. Wesleyan seemed to be in pre-exams mode as their collective heads seemed to be somewhere else this evening. Sloppy play and turnovers were prevalent tonight. The team is allowed a mulligan as they still won by 18 over a much larger Class AAAAA school. Izzy Larsen led the scoring effort with 25 points to go with four rebounds and two steals. AC Carter put up 18 points to go with seven rebounds, four assists and four steals. Alyssa Phillip added 11 points while Paige Lyons had a game high 12 assists to go with seven points, four rebounds and four steals. Wesleyan improves to 9-0 on the season with Class AAAAAAA Brookwood on the horizon on Saturday. The Lady Wolves face the Broncos at 4:15 on Saturday at Norcross High School. Wesleyan's long home stand continued Friday night. Class A No. 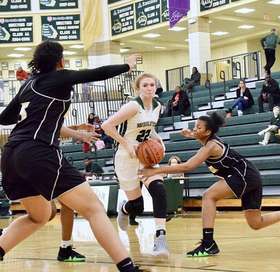 10 ranked Landmark Christian drove up to Norcross from Fairburn to take on the top ranked Lady Wolves and was handed a 70-26 loss in front of a nice sized crowd at Yanecy Gymnasium. This was the fifth straight home game for Wesleyan and the outcome was never in doubt. The Lady Wolves led 21-2 at the end of the first quarter and 35-11 at halftime. Despite the lopsided lead, Coach Azar wasn't happy with her team's effort in the first half, mainly the lack of team cohesiveness. The third quarter was a different story as the team did a better job of sharing the ball and pushing it up the floor. The result was a 23-9 advantage in the period resulting in a 58-20 lead heading into the shortened six-minute fourth quarter. Junior AC Carter turned in another double double as she led the team in scoring and rebounds with 15 points and 15 rebounds to go with five assists and two steals. Senior Callie Weaver put up 13 points, five rebounds and four assists while Sophomore Alyssa Phillip had 12 points. Sophomore Nicole Azar added nine points, three boards and two assists for Wesleyan while junior Izzy Larsen eight points, six rebounds and two steals. Sophomore Paige Lyons chipped in seven points, three steals, three assists and two boards for the Lady Wolves who improve to 8-0 on the season with the win. The last game of this six-game homestand will be Tuesday night as Cedar Shoals travels to Norcross from Athens. Tipoff is 6:00 PM. 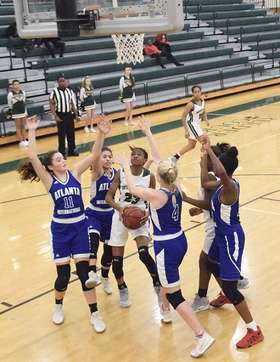 Prince Avenue travelled to Peachtree Corners from Athens and was handed a 68-28 loss courtesey of the Lady Wolves Tuesday night. The Lady Cavaliers found themselves down 10 in the first quarter but were able to cut the lead to just five points as Wesleyan led 17-12 at the end of the first quarter. The offensive flood gates then opened for Wesleyan as their defense generated their offense. 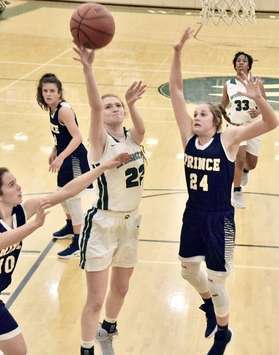 Wesleyan outscored Prince Avenue 29-2 in the second quarter, opening a 46-14 lead at the half and the game was out of reach. Paige Lyons led Wesleyan in scoring and steals with 18 points and seven steals respectively. She also chipped in four rebounds. AC Carter recorded another double double with 15 points to go with a game high 14 rebounds. Izzy Larsen had 10 points and eight rebounds while Nicole Azar put up eight points and two assists. Alyssa Phillip chipped in six points and three boards for the Lady Wolves who upped thier record to 7-0 on the season. Prince Avenue drops to 1-3. Wesleyan will next face Landmark Christian in its region opener on Friday at Wesleyan. Tipoff is 6:00 PM. 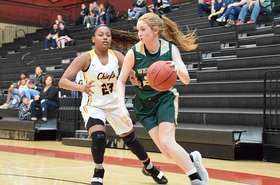 Old rivals Wesleyan and Greater Atlanta Christian met for the first time in almost three years Saturday night at Wesleyan. The Lady Wolves emerged a 65-55 winner over the AAA No. 6 ranked Spartans in a very physical battle. The two Norcross schools hadn't played since February of 2016 when Wesleyan elminated GAC in the semifinals of the Class AA state tournament. Since then, the Georgia High School Association reclassified GAC into Class AAA while placing Wesleyan in Class A. Things started off well enough for Wesleyan as they led 21-11 at the end of the first quarter. Wesleyan upped its lead to 33-21 at halftime. The Lady Wolves' lead grew as high as 18 points midway through the third quarter before GAC upped it's defensive pressure. Their full court pressure allowed turnovers which turned into GAC points. GAC outscored Wesleyan 16-10 cutting the lead to 43-37 heading into the fourth quarter. GAC cut the lead to two at 45-43 midway through the fourth quarter. Then a three pointer by Nicole Azar and a layup by Paige Lyons stretched the lead back to seven at 50-43 and GAC never threatened again. Four Wesleyan players scored in double figures led by Paige Lyons with 17 points, three assists, three steals and three rebounds. Callie Weaver scored 16 points and took a monster five charges. AC Carter added 15 points and eight rebounds for the Lady Wolves while Nicole Azar had 10 points and three assists. Wesleyan improves to 6-0 with the win while GAC drops to 3-3. They next face Prince Avenue on Tuesday at Wesleyan. Tipoff is 6:00 PM. 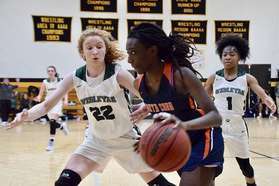 Wesleyan returned to the court after a nine day Thanksgiving layoff and posting their biggest win of the young season, besting Class AAAA St. Pius 91-28 Thursday night at Wesleyan. The Lady Wolves rolled to a 28-6 lead at the end of the first quarter and led 49-19 at the half. This was a game when the team was clicking on both ends of the floor. Sophomore Nicole Azar had the best all around game of her career as she led the team in points and assists. She recorded career highs in both, scoring 33 points while dishing eight assists. She also had five steals. Azar broke the school record for three-pointers in a game as she canned eight threes on 8-for-14 shooting from behind the arc. The previous record of seven was held by three different players. Nikki Luckhurst ('04), had seven threes in a game on three different occasions. Jenny Hall ('02) and Jameson Kavel ('17) made seven threes in a game one time apiece. Fellow sophomore Paige Lyons also had a big night pouring in 24 points to go with seven assists and seven steals. Senior Callie Weaver had a season-high 16 points on 4-for-5 shooting from the three point line. She also chipped in six assists. Junior AC Carter added eight points and six rebounds for Wesleyan in limited playing time due to foul trouble. Sophomore Alyssa Phillip added four points and four rebounds for Wesleyan while junior Izzy Larsen added a two points and five boards in limited playing time due to foul trouble. The Lady Wolves improve to 5-0 on the young season with the win. Wesleyan will next face Class AAA No. 6 ranked Greater Atlanta Christian (3-2) on Saturday at Wesleyan. Tipoff is 6:30 PM. 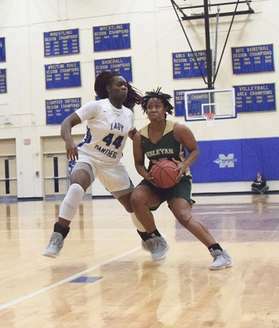 The start was slow but the finish was positive as Wesleyan rolled over Class AAAAAA Pope posting a 69-42 win in the first ever meeting between the schools. 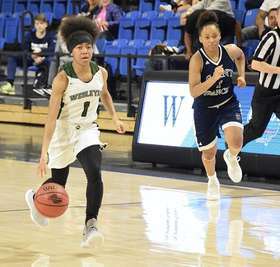 After three games away from home, the Lady Wolves' home debut began inauspiciously as the visiting Greyhounds scored the games' first five points. Wesleyan finally got on the board after going scoreless for the first five minutes of the game. They closed the first quarter on and 8-0 run leading 8-5 at the end of one. Both teams seemed to get into a better flow in the second quarter as Wesleyan outscored Pope 24-14 talking a 32-19 lead into halftime. The lead was stretched to 23 points as Wesleyan took a 54-31 lead at the end of the third quarter. The team continued to roll in the fourth with all players getting in on the action. AC Carter led the scoring for Wesleyan with 23 points along with eight rebounds, three steals, two assists and two blocked shots. Paige Lyons put up 14 points, five rebounds, four assists and two steals while Nicole Azar had 12 points. Izzy Larsen had another double double with 12 rebounds and 10 points. She also had four steals, two assists and two blocks. Alyssa Phillip finished with six points and three rebounds while Jessie Parish finished with four points and four boards. Wesleyan ups its record to 4-0 with the win while Pope drops to 1-1. The Lady Wolves will take a break to enjoy Thanksgiving and get right back to work next Monday. Tonight's game was the first of six straight home games. Up next is a meeting with St. Pius next Thursday, November 29. Tipoff is 5:30 PM at Wesleyan. Wesleyan defeated Class AAAAAA No. 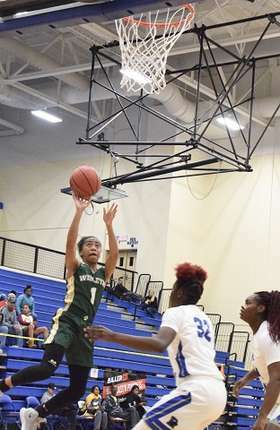 5 ranked Stephenson 60-49 in a non-region contest held at Parkview High School Monday night. It was the third overall meeting between the schools and the first since a 67-59 Wesleyan win in Mrytle Beach, South Carolina back in 2009. 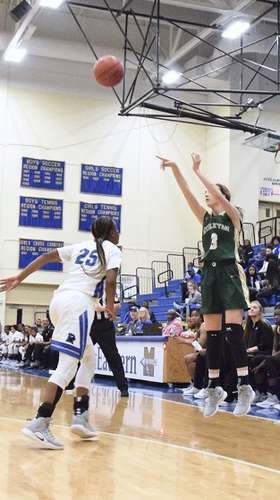 On a night when shots weren't falling, the Lady Wolves were able to find a way to beat a speedy, athletic Stephenson squad. Stephenson, a Class AAAAAA school from Dekalb county, was knocking down shots left and right in the first quarter as Wesleyan aided their efforts by turning the ball over. The Lady Jaguars built a 19-9 lead at the end of the first quarter. 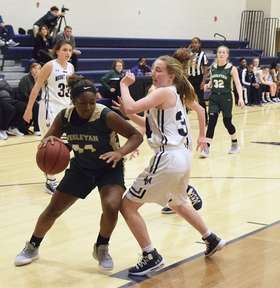 Wesleyan changed up its defense in the second quarter and the pendulum began to swing in the Lady Wolves' favor. Wesleyan went on a 15-3 run and took a 24-22 lead at the 2:48 mark. The Lady Wolves took a 30-27 lead into halftime. Wesleyan continued to play better defense in the second half as Alyssa Phillip and AC Carter did a nice job on the defensive boards. The Lady Wolves' lead increased to 47-39 at the end of the third quarter. Wesleyan then outscored Stephenson 13-10 in the fourth, effiectively finishing off the Lady Jags. As stated earlier, Weslyean's shooting percentage wasn't stellar to say the least. The team shot just 38% from the field on 18-for-47 shooting and were also a not-so-good 57% from the free throw line on 20-for-35 shooting. Still, this was a good test for a young Wesleyan squad with only three upperclassmen on the roster. Sophomore Paige Lyons led the Wesleyan scoring effort with 13 points to go with five rebounds and two assists. Junior AC Carter barely missed a double double as she scored 11 points to go with nine boards and two blocks. Senior Callie Weaver took an elbow to the nose in the second half....was called for a foul no less, but still had a strong night scoring 10 points while grabbing five rebounds and dishing a pair of assists. Junior Izzy Larsen added eight points and a team high 11 rebounds and had three blocks. Sophomore Nicole Azar chipped in seven points, two assists and a steal while fellow soph Alyssa Phillip added five points and four boards. The team showed much resolve in battling back from an early double digit deficit to post a double digit win. Wesleyan is now 3-0 on the season and will be making 2018-2019 home debut tomorrow against Class AAAAAAA Pope tomorrow. Tipoff is 2:30 PM at Wesleyan. Wesleyan travelled to Buckhead tonight to take on Pace Academy in the season opener and emerged a 64-21 victor. The Lady Wolves built a double digit lead in the first quarter which carried over to a 37-14 advantage at halftime. The lead balooned to 57-18 heading into the shortened 6-minute fourth period. 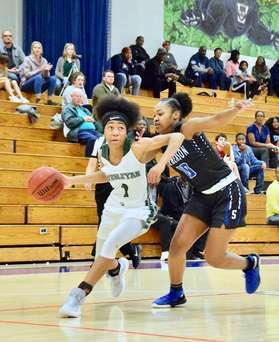 Junior AC Carter led the Lady Wolves' scoring effort as she put up 17 points along with eight rebounds, three assists and three steals. Sophomore Paige Lyons had 11 points, a game high seven assists and five steals while junior Izzy Larsen had 12 points, a game high eight rebounds and four steals while senior Callie Weaver had 10 points and four boards. Sophomore Nicole Azar and freshman Jessie Parish chipped in five points apeice. Wesleyan is 1-0 on the season. Pace drops to 0-2. Wesleyan will take the court again on Saturday when they take on Class AAAAAAA Sequoyah. The game is at Johns Creek High School. Tipoff is 3:30 PM. Wesleyan travelled to Southwest Dekalb Wednesday night and posted an impressive 69-47 win over the traditional powerhouse from Class AAAAA. The first quarter was tight with Wesleyan leading 11-8 at the end of the period. The Lady Wolves open it up in the secord quarter outscoring SW Dekalb 20-4 in the period taking a 31-12 lead into halftime. The third quarter saw more offense from both squads as Wesleyan increased its lead to 54-30 heading into the fourth period. SW Dekalb outscorded the Lady Wolves 17-15 in the fourth but Wesleyan had built a large enough cushion where that was inconsequential. Sophomore Nicole Azar led the Wesleyan scoring effort with a game-high 21 points including going 5-for-7 from the three point line. She also had three rebounds, two steals and finished the game shooting 78% from the field. Junior AC Carter had 14 points, five assists, four rebounds and four steals. Paige Lyons added 10 points, a game-high seven assists and three rebounds. Alyssa Phillip added eight points and two boards while Izzy Larsen put up seven points and three boards. Senior Callie Weaver chipped in six points, had two steals and took a pair of charges. The 2018-2019 season officially begins this coming Tuesday, November 13 when Wesleyan heads to Buckhead to take on Pace Academy. Tipoff is 5:30 PM.